In the drylands of Africa about 90% of the population is rural and depends on subsistence agriculture for their livelihoods. There is an increasing pressure on the natural resources due to the high population growth, and farmers are constrained to cultivate marginal lands, thereby compounding the land degradation problem. Low and erratic rainfall, its poor distribution within the growing season, prolonged dry spells, lack of adequate water supply due to soil physical degradation (soil crusting) and nutrient shortage adversely affect crop growth and yields. To address these problems, indigenous, easy to implement innovations such as the zai system may provide solutions to increase productivity. The effect of three planting techniques (Flat, zai pit of 25 cm and zai pit of 50 cm diameter) and three fertility management options (control, crop residue, cattle manure) were tested at Damari in 1999 in Niger. Soil water was monitored from weekly measurements using a Didcot Wallingford neutron probe throughout the growing period. 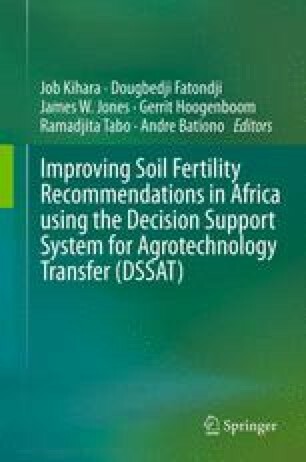 Data from that experiment were used to determine if the CERES-Millet model of the Decision Support System for Agrotechnology Transfer (DSSAT) is sufficiently robust to predict yield response to the zai water harvesting system. The model simulated the observed yield response of the control and the manure-amended plots with high r-square (0.99), low residual mean error square (340 kg·ha−1 for above ground biomass and 94 kg·ha−1 for grain yield) and high d-statistic (0.99), but this was not the case for the crop residue treatment, which was over-predicted. Soil water content and extractable soil water were also well simulated for the control and manure treatments. This evaluation of DSSAT provides a starting point for research to evaluate the performance of these technologies over wider areas in West Africa. The application of models for such studies must be interpreted in the context of limitations of the model to address some constraints. Nevertheless, the highly variable crop responses due to interacting effects of rainfall, management and adverse soil conditions in this region make this an extremely important approach in planning for technology ­adoption in an area and in interpreting results from experimental field research.